Come and explore the beautiful Atherton Tablelands on this full day tour. Visit five pristine waterfalls and explore the rainforest along the way; really discovering all that the region has to offer. 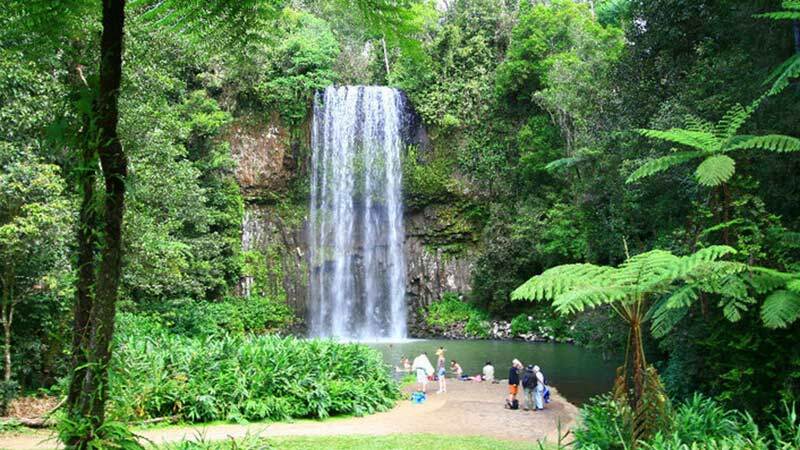 Enjoy a full day tour of the gorgeous Atherton Tablelands; a region laden with cascading waterfalls, lush rainforests and perfect scenery. Start your day off checking out the amazing Cathedral Fig, then head round to Lake Eacham where you can take a refreshing dip while enjoying morning tea. You will then continue onto Dinner Falls and The Crater - a gushing waterfall with a 138 metre vertical crater, formed by an explosion of volcanic gas. You will then head to Millaa Millaa pub for lunch (at your own expense) and to mingle with some of the locals. Be sure to bring some personal spending money or a packed lunch, if you prefer. Stopover at the stunning Millaa Millaa Falls along the way to the picturesque Crawford’s Lookout; a photo hot spot. Josephine Falls is next and will leave you breathless. Afternoon tea will also be provided at this stop, before you head back for your evening in Cairns. Tour operates Monday-Saturday, departing from Cairns at approx. 7.30am and returning at approx. 8pm.